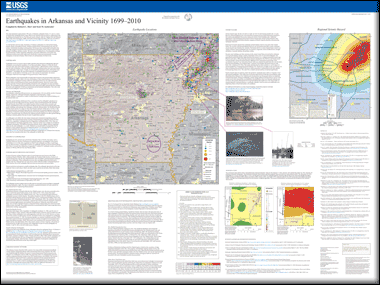 This U.S. Geological Survey map poster summarizes approximately 300 years of earthquake activity in Arkansas. It is one in a series of similar State earthquake history maps. Work on the Arkansas map was done in collaboration with the Arkansas Geological Survey. The earthquake data plotted on the map are from several sources: the Arkansas Geological Survey, the Center for Earthquake Research and Information, the National Center for Earthquake Engineering Research, and the Mississippi Department of Environmental Quality. In addition to earthquake locations, other materials include seismic hazard and isoseismal maps and related text. Earthquakes are a legitimate concern in Arkansas and parts of adjacent states. The largest historic earthquake in the vicinity of the State was an intensity XI event, on December 16, 1811, the first earthquake in the New Madrid sequence. This violent event and the earthquakes that followed caused considerable damage to the then sparsely settled region. Since 1811 Arkansas has undergone a number of felt earthquakes of magnitude 4.0 and greater. The most significant recent and ongoing earthquake activity are the events of the Enola swarm. Since beginning on January 12, 1982, more than 40,000 events have been recorded. The largest of these was a M4.0 on October 11, 2010. Contains: associated data files. Refer to the Readme and Metadata files for more information. Dart, R.L., and Ausbrooks, S.M., 2011, Earthquakes in Arkansas and vicinity 1699–2010: U.S. Geological Survey Open-File Report 2011–1118, 1 sheet.